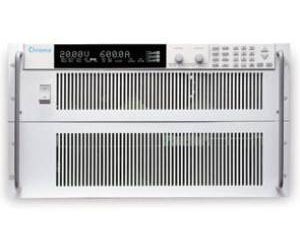 Chroma 62120 Series of variable-output, programmable DC power supplies are designed for use in ATE, burn-in, plating, and other high power systems for a broad range of applications. The 62120 Series of constant voltage, constant current power supplies are available in power ranges within 12KW. All models have 10-turn voltage and current controls that vary the voltage (10V~600V) and current (20A~1200A) outputs from zero to the maximum rated values. The operation of crossover from constant voltage constant current occurs automatically when the load current exceeds the control setting. Also the provided adjustable current limit lets you set the current limit without shortcircuiting the output. The 62120 Series has 100 user programmable front panel input status for automated test application. In addition a 16-bit digital control with bright vacuum fluorescent display readout, bar graphs and status indicators is equipped for the real time measurement of voltage and current. The 62120 Series can be operated easily either from the front panel keypad or from remote controller via GPIB (option), and RS-232 & APG (standard). With a size of 5.22 inch, it is very compact and able to stack easily in a standard rack.